Strong, powerful and incredibly vulnerable to conflict with people, loss of habitat and prey. About 20,000 African lions remain in the wild today. Numbers have plummeted by over 40% in the last three generations. Three quarters of lion populations are in decline. They are listed as 'Vulnerable’ on the IUCN Redlist. Animal adoptions like yours give a huge boost to our work. 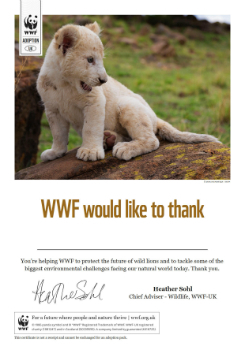 They not only help fund projects to work with local communities to monitor lion movement and reduce human-lion conflict but also fund our other vital work around the world. 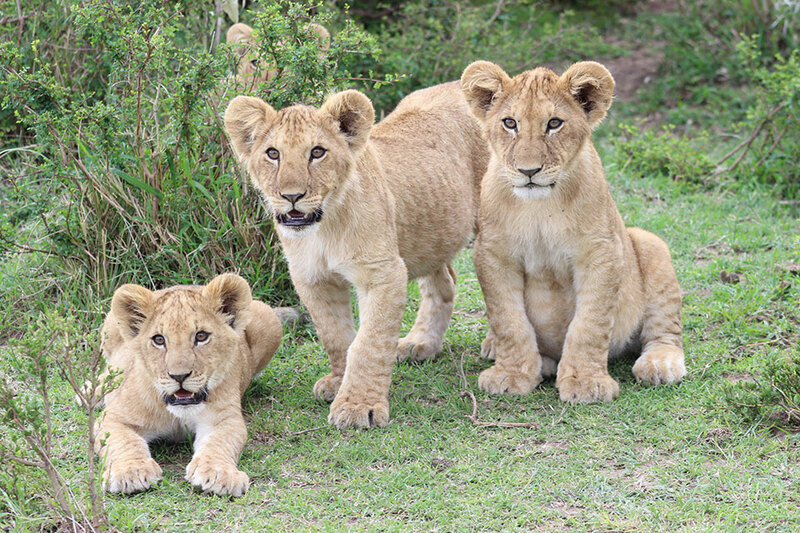 Give a gift that will help protect the future of lions and their habitats. African lions are currently found in much of sub-Saharan Africa, with key populations in protected areas in Botswana, Kenya, South Africa, Tanzania and Zambia. Lions are the most sociable of all big cats and live in groups called prides. Lions living outside protected areas are more likely to prey on livestock and local farmers who need to protect their herds and their livelihoods are likely to retaliate. In recent years the trade in lion bone as a substitute for tiger bone in traditional Asian medicine has risen. People are clearing land to make way for agriculture and the increasing human population. 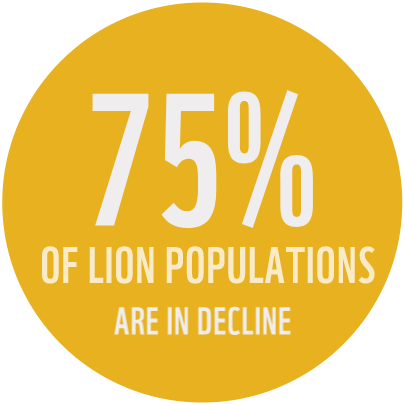 Destroying and fragmenting lion habitat has reduced their natural prey numbers. For many years, we’ve been helping to establish and improve protected areas that are supporting lions in key places throughout Africa. We also work in a number of places to secure space for wildlife by working with local people in conservancies and helping them benefit from the wildlife around them. 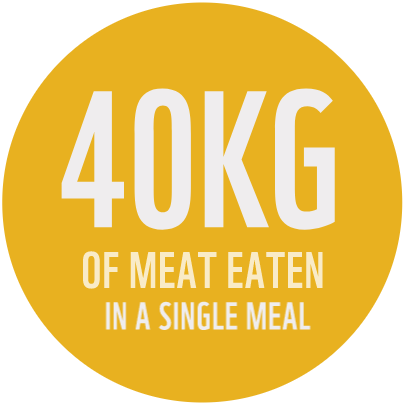 We support the Mara Predator Conservation Programme, which monitors and protects lions in Kenya’s Maasai Mara landscape. Here, we’re helping study the lions’ movements and behaviour to better understand local populations. Learning more about the needs and behaviour of these magnificent cats, and the threats they face, will help us to protect them in the long term. A lion's roar can be heard from as far as 5 miles away and prides often roar together to mark their territory.